Why Not Have a Pond With Ducks in Your Front Yard? It is fascinating to watch ducks swimming in a pond. They seem to be on a royal cruise with their heads held high and opening their beak to quack merrily. Isn’t it a great idea to have a duck pond in your front yard! Apart from its aesthetic appeal, a water body in your front yard has many advantages such as creating a cool atmosphere and absorbing dust particles. A pond with aquatic plants and ducks and other water fowls makes you happy every time you step into your front yard. Care needs to be taken to select the right spot and the appropriate design for the pond. An unnoticed pothole or drain at the bottom can cause the water to drain out and leave a muddy hole. 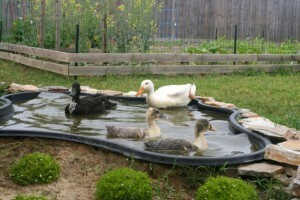 The depth and water level is also very important in order to allow the ducks to reach food at the bottom. Shady trees on the edges will add to the beauty and provide shelter to the ducks in hot summer. The quality of water, especially the saline level, has to be properly maintained to ensure the health and hygiene ducks and other birds coming to your pond to drink water and bathe. Professional help is available to construct an aesthetically designed duck pond with beautiful landscaping and proper arrangements for its cleaning and maintenance. They take care of all the details right from selecting the spot to water level regime, nutrient level and shading by trees. When the idea is so exciting, imagine how wonderful it will be to enhance the beauty of your house and improve the quality of your life by adding an ornamental pond in your front yard! This entry was posted in Animal Fencing, Garden Fence and tagged Front yard, Home & Garden, Pond. Bookmark the permalink.